Did you know that upwards of 2 million hybrid vehicles are now sold in the U.S. each year? As these cars continue to age, many vehicle owners are realizing that they now need to — or will soon need to — understand how to replace batteries in hybrid cars. You may not have realized it, but hybrid battery packs typically do not last as long as their cars. 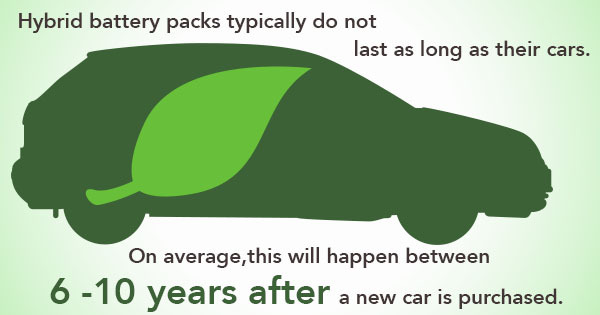 On average, this will happen between six and 10 years after a new car is purchased. Here are some important facts you should know about hybrid batteries. Will Hybrid Batteries be the Bane of Owning a Car? There’s a lot of myths surrounding battery replacement, so to be clear, this really isn’t something you’re going to have to do every couple years as a part of owning your car — and it’s also not going to be inordinately expensive. Newer generations of cars, unsurprisingly, tend to have batteries that last even longer. Not surprisingly, warranties vary by manufacturer, and you’re going to want to know the fine print on yours before you go and pay for a new battery. Most hybrid vehicles are now required by law to provide a minimum eight-year, 100,000 mile battery warranty. Around year five, though, you may start to move past that 100,000 mile mark, which is when you should make sure you have the budget available for a battery replacement. If your IMA light has come on, you may wonder what your options are. Honda has become more lenient over the years about covering legitimate battery problems, but if you have an older model car or many miles already logged, then your car battery is less likely to be covered in part or whole by Honda. Honda’s U.S. site notes that the battery-pack limited warranty varies by state, so you’ll want to consult your original purchase papers for details regarding your Honda Civic Hybrid IMA battery warranty. If you contact Honda, you will need your vehicle VIN number to do a status inquiry.